Drew McDonald (34) is recognized as the tournament's Most Valuable Player following the game against Coastal Carolina. McDonald had 31 points on the game. After leading the Norse to a perfect 3-0 record en route to the team title in the KEMI Northern Kentucky Basketball Classic, Drew McDonald was named Horizon League Co-Player of the Week, along with Green Bay’s JayQuan McCloud on Monday afternoon. 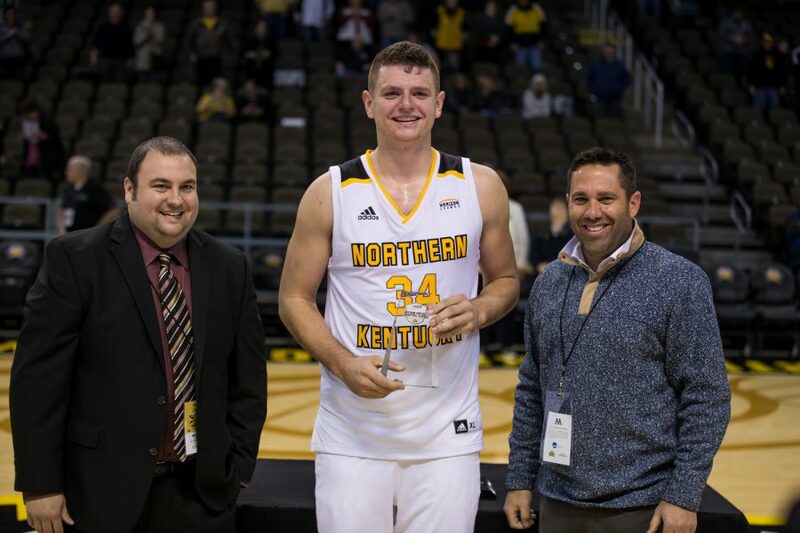 The Cold Spring, Kentucky native was named tournament MVP and highlighted the All-Tournament Team while averaging 21.3 points and 11.3 rebounds per game over the weekend. He also converted 18-of-34 (52.9 percent) from the field and went 24-of-29 (82.8 percent) from the charity line. McDonald picked up his 36th and 37th career double-double after tallying 14 points and 14 rebounds against UNC Asheville on Friday night, then exploded for 31 points and 12 rebounds against Coastal Carolina on Sunday evening to close out the tournament. In between those matchups, the 2019 Karl Malone Award watch list candidate poured in 19 points and eight rebounds to oust Manhattan. The former Newport Central Catholic standout continued to climb the Norse record books over the weekend as well. McDonald moved from 11th to eighth in all-time scoring with 1,547 points and to second all-time in rebounds with 823. McDonald and the Norse will be back in action on Saturday, Nov. 24 as they hit the road to Orlando, Florida for a weekend showdown against the University of Central Florida. Tipoff is scheduled for 6:00 p.m. and will be broadcasted on ESPN3.